It's usually around August where I start feeling a bit uninspired with my wardrobe. August and September are the hottest months of the year here, and while a lot of bloggers are previewing what's to come in Fall fashion, I'm over here reaching for anything that's loose, comfy, and breathable! I'll admit that even wearing jeans is a risky idea, but I live in denim so I do what I can to stay indoors in the air conditioning - such a fabulous invention! 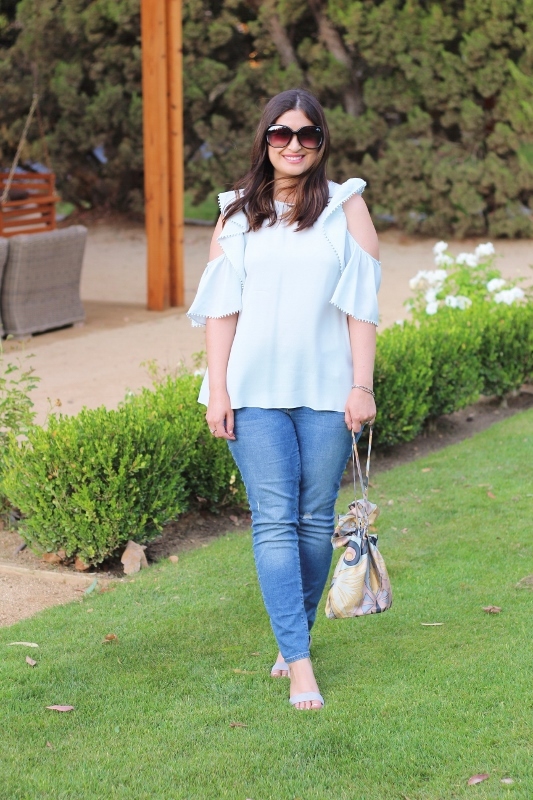 But lately, it's back to basics with a pretty cold shoulder blouse and my most worn-in sandals. Both are older, but they are still on heavy rotation this Summer. Building a wardrobe from a solid foundation of basics is a great way to make sure that your clothes work for you (although we do work for our clothes). I've really made an effort this year to pare down my buying, and before I do buy something new, I ask myself how many ways I can wear it? Does it fill a void in my wardrobe? If the answer is yes, then I can be confident that I'll get my money's worth. As I've gotten older, I know that basics don't automatically equal boring. Play with color and print, and you'll have something that's practical, hopefully something that lasts a long time, and you can add your own touches to make it feel special. How do you guys feel about fashion in August? Every post I read yesterday dealt with this topic! Hey, just keep me submerged in water until mid-September thankyouverymuch. Ha, you probably know I am on the fashion struggle bus this August. I'm going to be getting creative on post ideas to avoid feeling redundant in the outfits I post. And I am not about to go out in this weather in fall clothes! I love your criteria for buying clothes right now. You look very pretty in this summery top, and your hair is looking shiny and gorgeous as usual! 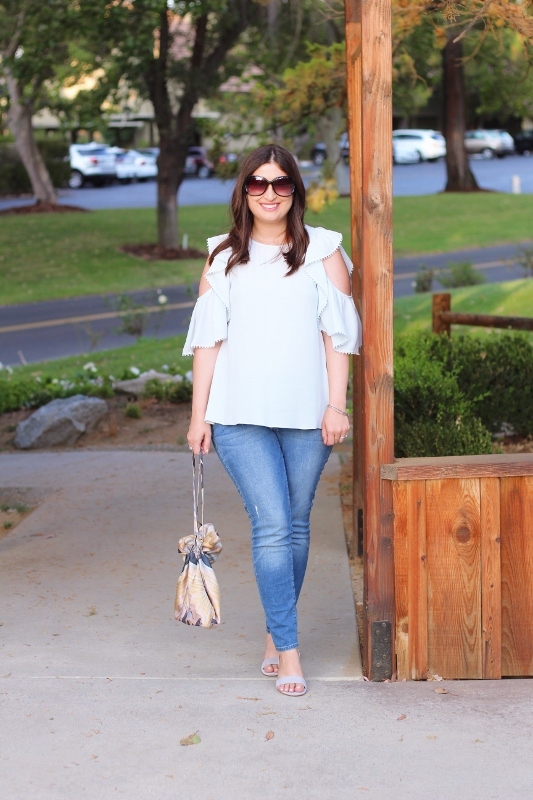 Sounds like you are making a good effort to only add worthy pieces to your closet, and I'm with you, it's still summer and hot and I'd take your cold shoulder blouse over some of the sweaters other bloggers are wearing right now! oh I will be wearing Summer clothing for a long time, I am so not ready for Fall. This top is so cute and I still wear my jeans too, I just try to stay inside.